If you are one of the millions of people around the globe celebrating Christmas this holiday season, you may be wondering what Santa is going to be filling stockings with. Some people look for small gifts to put in stockings, while small in size they often aren’t small in price (jewelry, video games, gift cards). Others find stockings stuffed full of candy on Christmas morning. Looking for stockings? 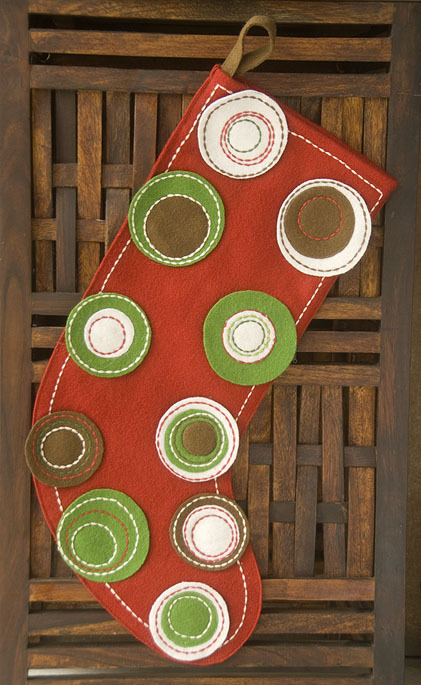 Check out woolen stockings, the photo is the Polka Dot Woolen Stocking from India Rose. « Social Media and Marketing Lesson for the makers of Motrin: Don’t Mess with Moms! I like the “Under the Nile Organic Sleeping doll”. I hadn’t seen those before. Thanks! 2 million celebrating christmas around the globe? Um, I’m pretty sure that must be a typo. I believe you will find that there are a lot more than 2 million Christians in the world. Otherwise, neat article. @ John, you are right, 2 million wasn’t correct. Now I can’t find the statistic I was looking at(though I believe it stated 2 out of every 6 million people), so I have removed the number. Thanks! Love those elephant poo notebooks! My daughter got such a kick out of them. 🙂 Another idea is a donation certificate to a non-profit. We always contribute money to the National Wildlife Federation since my daughter is such a big fan of animals. This has helped her also appreciate and recognize the importance of philanthropy.